Well Can’t You Use a TV Instead? 32 inch monitors are a new breed of monitors. The question that you should ask when buying this size of monitor is: what would be more feasible to do? 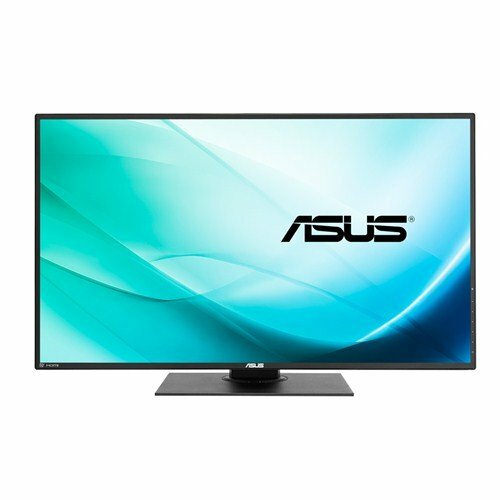 Buying a TV s or just buying one large 32 inch monitor? Majority of the responses would favor into buying one large monitor because no matter how what, monitors almost always have better visual than TVs. There are numerous benefits to having a large 32 inch monitor. First of all, if you get some of the high end ones, they have a lot of features specific to professional use. Having one large monitor on your desk will not give you any neck strains from moving your head from side to side as all your concentration will be on that one monitor only. The display will be huge and it can be used either for working or to perform several other activities. Not only that, gamers would love this display and would enjoy the seamless display gaming without having any gaps in the view. On productivity basis, having one large display makes it better for you. The large display gives you enough space to open up multiple windows without the text getting too small to read. The large monitors usually come with extra ports so this favors the work process too. Having a 32 inch monitor eliminates the need to have an extra TV as you can utilize the same screen for both purposes. The pixel density on the large screen will give clear picture even if it is being viewed from a greater distance, so definitely better than the usual TVs. There are many different resolution that you can expect in a 32 inch monitor. 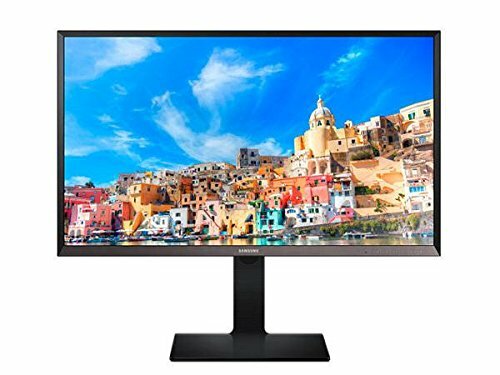 Although many would imagine that these monitors only have WQHD or higher resolution, you will be surprised to know that you can even find FHD monitors. The benefit of which is that these monitors are very affordable, yet have a large screen. In the race of technology, competition has gotten intense than ever which is why you will see a number of brands competing against each other. 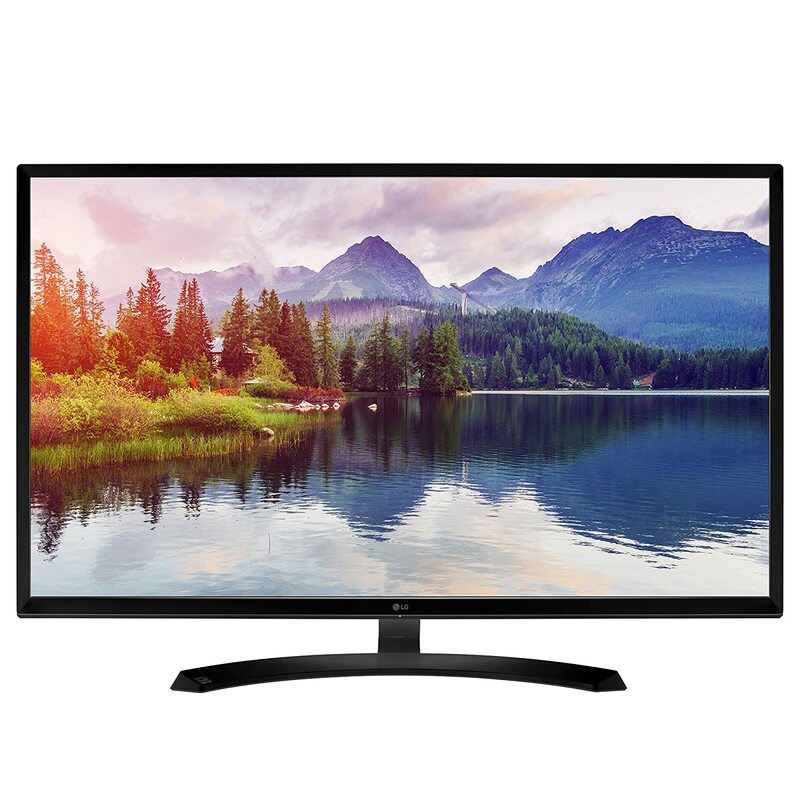 Similar to this you will find a number of brands with their 32 inch monitors, Samsung, ASUS and LG for instance, and these detailed reviews on best 32 inch monitors will help you decide upon the best one that you will buy. The best 32 inch monitors as far the price value is concerned. This monitor has taken the market by a storm and has thus become #1 New Release on Amazon. What makes this monitor so special? It’s price tag. 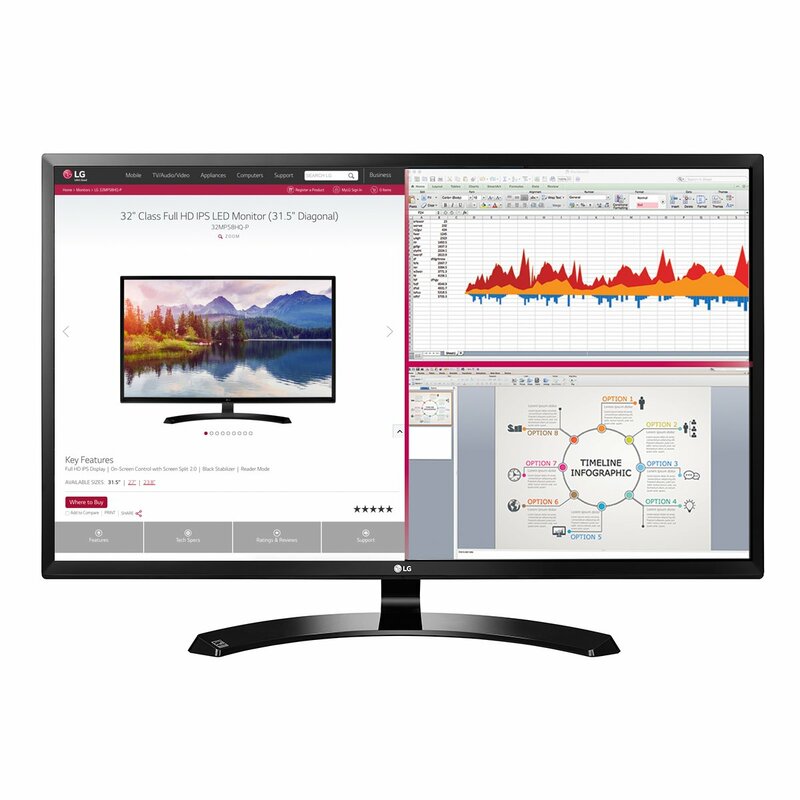 This is an LG monitor with Full HD and 32 inch display. It has multiple ports such as display, HDMI, two USB 2.0 and one 2.0 up, which means that at the same time different types of data inputs can be supported. The 32 inch size gives 70 percent larger screen and viewable area than a 24 inch monitor. On screen control is really an attractive feature because it enables a quick access to main settings that otherwise would require to go all the way to the back of the monitor and fix from there; brightness and volume for instance. Another noteworthy feature is its VESA compatibility which means that the monitor can also be mounted on a wall or even a stand depending on what the user prefers. A special reader mode is there to help users if they want to read online and not get the usual eye fatigue that they suffer with. The response that customers gave was too good. They were all extremely happy with the affordability of the monitor because other monitors with similar features were usually nearly four hundred bucks. The resolution and brightness is great, even for someone who is sitting at a distance of about 50 inches. The monitor is perfect for everyday use and the IPS technology further adds to its advantages. Only problem that many people faced was that the reflection on the screen was a little too much than standard reflection. This made it difficult to work on. About 88 percent of the users gave it a full 5 star review which is too good comparing to the response that other monitors of the same size received. Samsung, we all know, is a renowned and well known brand when it comes to manufacturing technology related products whether they are phones or TVs. Samsung’s new LED monitor comes at a reasonable price given it specs. It has a large 32 inch display with high resolution of 2560 x 1440 pixels, which is 4 times the HD resolution. An additional feature is the 100 % sRGB Color Compliance which gives the most exquisite display experience with clear and bright colors. This is important if you are going to be using this monitor for professional designing work. The multi screen function of it works perfectly fine without any disturbances. The Picture-in-Picture viewing feature further complements it. With this feature, you can have two sources of display on the same screen. The hinge technology allows the user to make adjustments to the height and even tilt or swivel the monitor. There are also multiple port options; display port, HDMI and USB 3.0. As expected, the customer responses were great. They were extremely happy with the size of the monitor and it helped many of them get rid of the eye strain they once had with their previous desktops. The set-up process was easy and didn’t require much effort, as everything was already attached and it came along with an in depth instruction manual. The change from landscape to portrait position or vice versa was quiet easy. All in all, a good 70 percent of the users gave it a full 5 star review. LG has kept the design really classy and definitely lived up to consumer expectation. 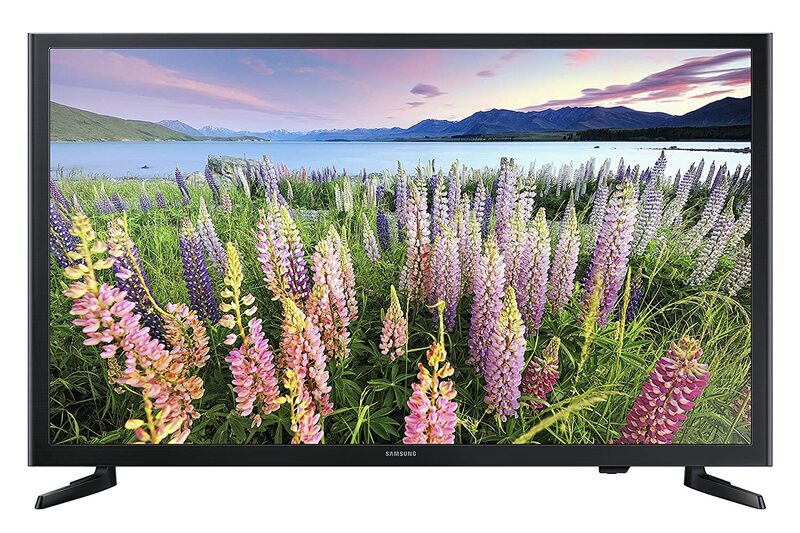 This 32 inch display comes at a fairly affordable price. It has a Full HD IPS screen. Color reproduction is much better and the viewing angles are much wider. The On-Screen Control makes it really easy for the user to quickly access basic settings like brightness, volume and sound. One problem that many users have with monitors is the eye strain they get; LG has eliminated that issue by allowing for reduction in blue light. Black Stabilizer of the monitor makes it easy to view darker patches on the screen much clearer. Everyone was extremely satisfied with all the features that were offered; from on screen control to split screen option. Many have praised the price point of this monitor. The setup process was quiet easy as it came with all the necessary ports and cables. The only issue was that the monitor does not have a good speaker system so you have to either buy headphones or connect a separate pair of speakers. On a whole, 74 percent of the users gave it a full 5 star review. One of the best 32 inch monitors as far as colors go. This is a professional monitor so it is a bit more expensive than the normal FHD 32 inch monitor. Special care has been given to eye strains and therefore the eye care technology with blue light filter makes it easy for users to read. Multiple port options are there including USB and display ports. The height and position can easily be changed with the help adjustability feature of tilt and swivel options that are there. Brightness and contrast ratio are good enough for a clear and crisp detail. Based on customer reviews, the resolution was great but there is a milky white hue all over the screen that brings the display down. The outlook is really decent and looks great whether as a TV or working monitor. 100 percent sRGB provides great color combination to the user. Modes are easy to change from landscape to portrait or vice versa. All in all, about 64 percent of the users gave it a full 5 star review and from the remaining, 14 percent gave a 4 star review. That is a good question. Technically you can use a TV instead. A 32 inch TV with FHD resolution, and HDMI connectivity would be as good as any monitor of similar specs. It would even have the added benefit of a good sound system. However, the color quality of the TV, response time and input lag can never match that of a monitor. Although to many the difference would seem marginal, gamers and enthusiasts would be quick to find the difference. This TV by Samsung has the almost the same specs as the LG 32MA68HY-P monitor. With a 1080p, this TV is almost as good as any FHD monitor of same size. This TV has a refresh rate of 60 Hz, with pretty nice colors for non IPS panel screen. HDMI port allows you to connect audio and video with just one cable. This monitor has amazing sound quality as compared to any monitor with speakers. The Connectshare movie feature allows the user to play any type of media through the USB supported device. A quick refresh rate and backlight technology further adds to the pros of this LED monitor. Those who bought it, 65 percent of them gave it a full 5 star review, which is actually a good response. It was easy for them to unpack the package and install it, and there were no complaints regarding any damaged component. A customer had never bought any Samsung device before and after this was more than pleased and even planned on buying more in future. The picture and sound both complemented each other, thus giving the ideal experience of watching TV or even working in office. The only issue was with the stand that held it up; the stand was not as strong and was a little unstable. Other than this, it is definitely worth the try. 32 inch monitors are a new trend in the market. They a perfect bridge between conventional monitors and TVs. These monitors do not have the audio capability as TVs, they do have amazing picture quality. You can find both budget and professional 32 inch monitors. Therefore, the price can vary vastly.